War had reached the gentle shores of Norrtälje. 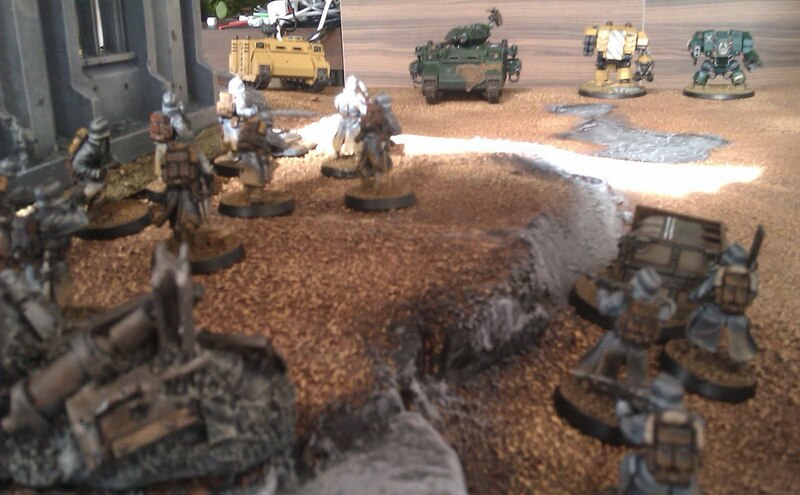 The evil forces of chaos had tricked the once loyal Death Korps of Krieg and it was up to a coalition of Astartes to put an end to the renegades. Two battles were fought, one short and one long. 'Twas my mighty Imperial Fists and John's stoic Dark Angels versus Nicklas' lowly Blood Pact and Johan's gullible Death Korps. 1500 pts vs 1500 pts divided evenly. The first game was a game of dice. It was a Hold The Line, but with Kill Points instead. The Astartes defended the hill in the middle with the forces of Chaos attacking. Both sides had clear plans for the battle and spirits were high, it was all set up for an epic fight. But instead it turned into an a game of luck. It was over in two turns, faster than the actual set up. A game of rolling dice with the Gods of Chaos granting unholy fortune to one side and the other side was cursed with Tzeentch's Eye of Snake. The second fight was a Dawn of War setup with three missions, Objectives, kill an enemy psyker and Kill Points. With a crazy rule on top, like the rules for Veil Of Darkness at the beginning of the Movement phase. Both sides managed to take out the others psyker and Kill Points was granted to the Imperial side so objectives was the true battle. Five objectives placed in varies corners gave us a challenge. With only three units on the Imperial side able to hold objectives we had to plan carefully. And plan we did! With me taking time to think, trying to minimize mistakes, and John's decision anguish the game turned into a discussion of persuasion and tactical views on our side. But then again we made few mistakes that day. A fun fight, albeit a very long one, breaking the seven hour barrier generously. Next time, perhaps a time limit for tactical discussion? Despite the crappy first game and the marathon of talk that the second game was, it was a good day. 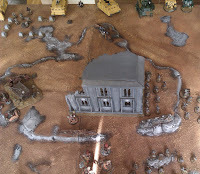 A fun day with friends over a few games of 40k and an excess of coffee. But you did not deserve the point for the psyker since he died by his own rage!